KAW...KAW! 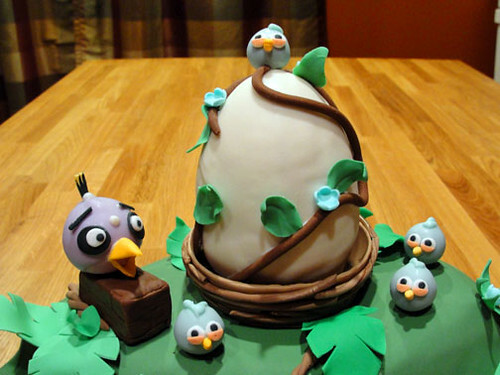 An Angry Birds Baby Shower Cake! Late January, I was given an interesting challenge by my friend, Mistey. She was designing a baby shower invitation for our friend, Chhunnary. When she told me what she wanted as the theme, I was excited. I have to admit...I am a bit of an addict, and who isn't?! Everyone loves Angry Birds! 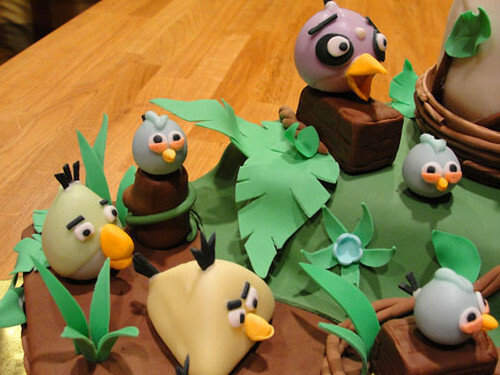 I just couldn't wait to bring this pastel Angry Birds jungle cake to life. Taking cue from the invitation, I wanted to incorporate the various birds, a nest, and an egg into a lively jungle scene. Unlike my previous cakes, this one combined the multiple elements of cake carving, fondant and gumpaste work, and cake pops! 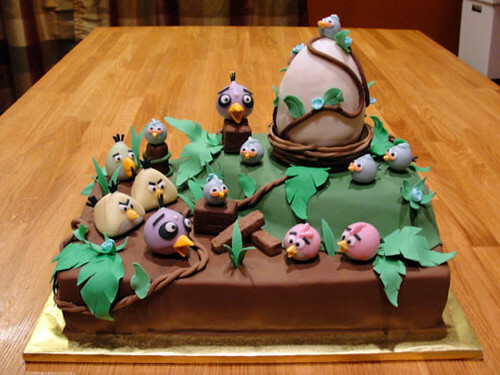 Yes, those little detailed birdies are cake on a stick. Starting a week prior to the baby shower, I cut out various leaves out of gumpaste and allowed them to dry in formers for a life-like shape. These will give my cake canvas a burst of green foliage. The next item that I had to create was the detailed nest. Using a small bowl as a former, I draped a sheet of brown gumpaste over the bottom and cut it to the right height for the nest's base. This was left to dry over the next two days. Using a dark and a light shade of brown gumpaste, I kneaded them together just enough to create wood-like swirls for twigs used in the nest. Thin ropes in various lengths were then rolled out by hand and then shaped over a small bucket for the perfect curvature. After the parts of the nest were dried completely, I attached the curved twigs around the nest base with a touch of piping gel. This stuff holds like wonder for heavier pieces! The next item on the list that required some patience and steady hands were the Angry Birds! I baked a 9" x 13" pan of my chocolate cake recipe and let it cool for several hours until completely cooled. Now comes my favorite part about cake pops...DESTROY! Yes, you bake a cake just to break it up...make sure there are no chunks. I crumbled up half of the cake and saved the other half for the cake itself. Once the cake was a fine crumbled mess, I mixed in about a quarter cup of cream cheese frosting and combined with large spoon. With my hands, I rolled out the various sizes and shape of the different birds. A quick 15 minutes trip into the freezer helped firm them up for handling, and then were kept in the fridge to keep them cool until I coated them. Using white candy coating and candy coloring, I mixed up the pastel variations of the birds, and shaped the various beaks, crowns, and tails out of gumpaste. 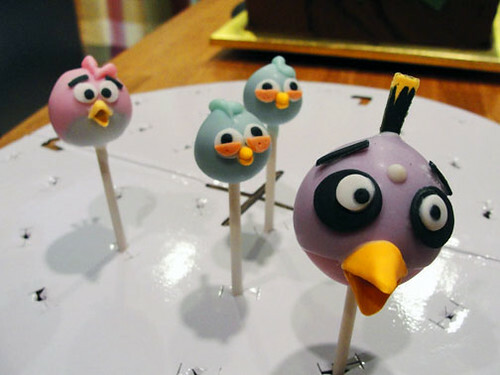 Lollipop sticks were inserted into each bird by first dipping one end in the candy coating and then inserted in the shaped cake balls. Immediately, I coated each one in the smooth candy coating and inserted into a florist block until the candy dried. I then was able to attach the beaks, and feathers by dotting on candy coating with a toothpick. Remember that huge egg? That is actually a giant cake ball that I poured white candy coating over on a cooling rack. The edible jungle was a 9" x 13" sheet of the same chocolate cake that I had torted and filled with chocolate bavarian cream. Remember the other half of the cake that I had saved from the cake balls? I torted and filled it, and placed it on top of my larger cake for more dimension. 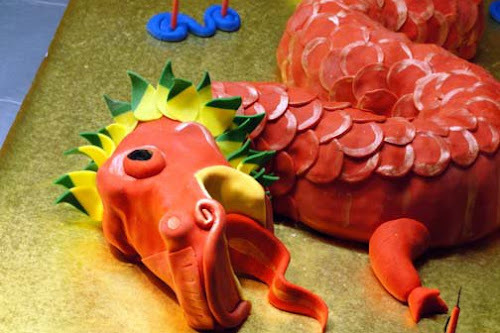 I then carved the cake slightly with a serrated knife for a smooth hilly slope. The entire cake was thinly iced with buttercream and then covered in a smooth blanket of rich dark chocolate fondant. Using a small circle cutter, I imprinted a series of rock formations on the sides of the tallest corner for a little added detail. I then rolled out a section of green fondant to place on top of the hill to create a lush jungle floor. 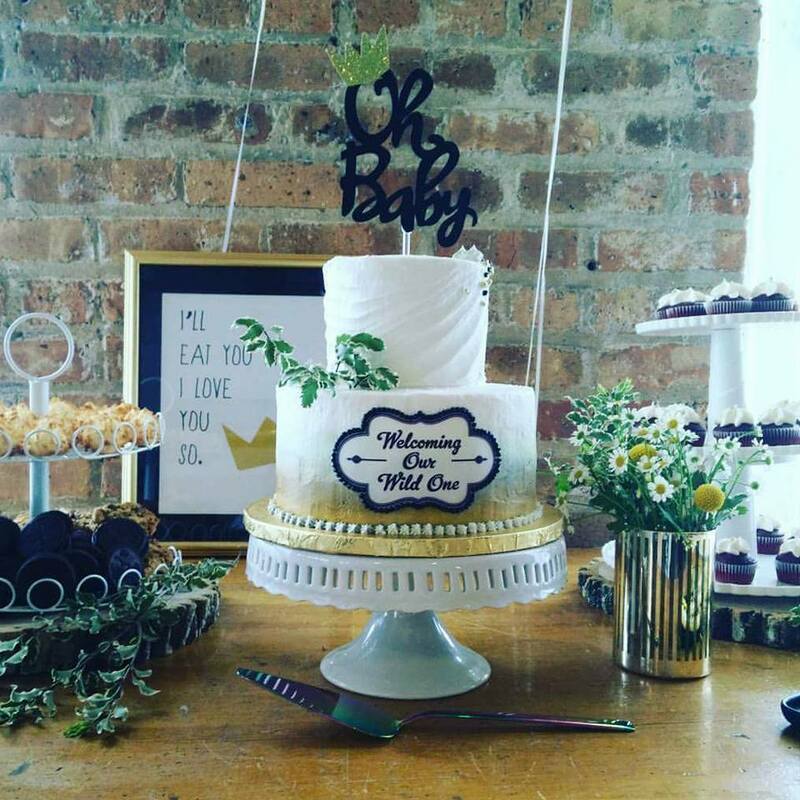 To add familiar elements to the cake, cereal treats were covered in a light chocolate fondant to create crates and wooden planks. There's even a small tree trunk for one of the birds to perch on! With the main part decorated, it was time to add the Angry Birds and the nested egg. Did I mention how heavy the egg was? It weighed a total of 5 pounds by itself! Normally, OI wouldn't have to worry about support dowels in a sheet cake like this, but this was going to require some help to not squash the cake. I figured out where I wanted to place the egg and inserted 4 cake dowels cut to the correct height. Using some piping gel, I first attached the nest and then a small cake board cut to size sits in the nest's interior. A dab of buttercream holds the giant egg in it place. The birds are then inserted into the cake in various positions and the lollipop sticks are trimmed to fit. 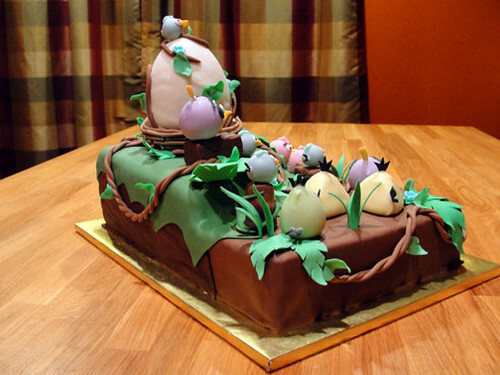 Using a clay gun, I extruded long ropes of chocolate fondant and wound them together to create a series of vines that were attached with a brush of piping gel, and wraps around the egg. The leaves and little blue flowers I made earlier bring this pastel jungle to life. Congrats to Anh and Chhunnary, and welcome baby Evelyn!